Properties in San Tan Heights average 4.7 out of 5 stars. Charming Queen Creek Home Near San Tan Mountains! Property 1: Charming Queen Creek Home Near San Tan Mountains! Peaceful Queen Creek House w/ Hot Tub Near Hiking! Property 4: Peaceful Queen Creek House w/ Hot Tub Near Hiking! Heated Private Pool! Beautiful San Tan Location with Arizona Room! Property 5: Heated Private Pool! Beautiful San Tan Location with Arizona Room! 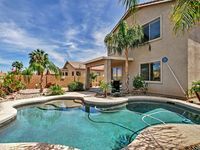 Queen Creek House w/ Private Hot Tub & Fire Pit! Property 6: Queen Creek House w/ Private Hot Tub & Fire Pit! Property 7: Comfortable, classy, spacious home now booking for the 2020 season. Property 9: Arizona Oasis Getaway. Amazing Home with All the Amenities! The Grand Canyon State. You've Got to See It! Make This Home Your First Stop. Property 13: The Grand Canyon State. You've Got to See It! Make This Home Your First Stop. Views, Heated Private Pool and Spa, Golf and Brand New Everything! Property 14: Views, Heated Private Pool and Spa, Golf and Brand New Everything! Piece of Paradise with a resort like pool! Property 15: Piece of Paradise with a resort like pool! Luxe San Tan Valley Home w/Pool-Near Golf Courses!